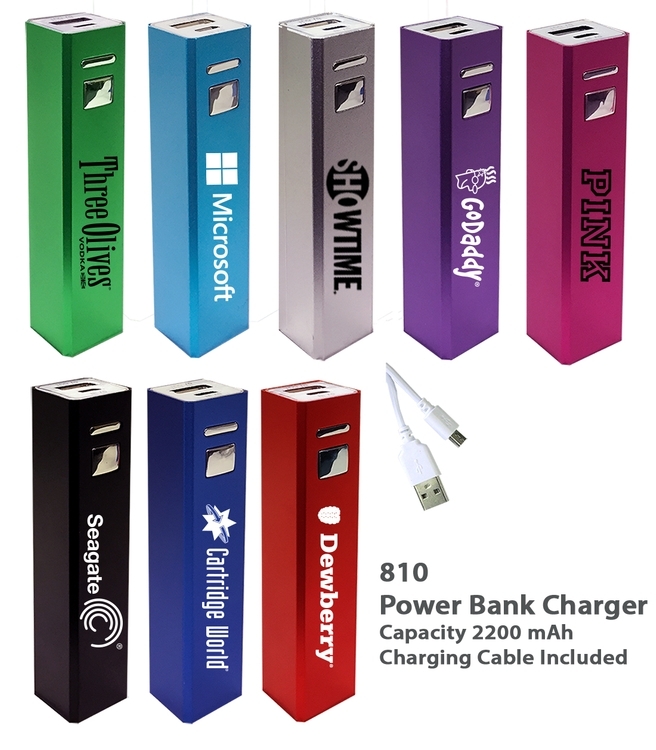 Make a lasting impression and be remembered for this useful and popular portable power bank charger... Made of anodized aluminum, each product uses a new reliable 2,200 mAh Lithium ion battery... The power bank's 5V/1000 mAh output charges using your device's existing standard USB cable; full charge is achieved in 3 hrs approximately... Rechargeable up to 500 times... Comes with a micro USB cable for charging the device... Built in LED light to monitor battery power and charging progress. Compatible with most smart phones, tablets, cameras and other devices that use the standard USB cable for charging... Available in popular colors of black, red, silver, medium blue & light blue, green, purple & pink. * Additional Location / Color run charge $0.50/V/ Piece.